Conjunction Junction, what’s your …… function?! I’m not sure if I’ve ever mentioned it (though I feel like I have) but every 8th grader in my school takes Algebra. This usually involves getting super creative with teaching them different ideas so they can grasp concepts they sometimes aren’t ready for. Recently, our Algebra kiddos took their state test. Of my 9 resource kiddos, 1 passed, 6 were in the retake zone, and 2 did not pass. (because Algebra is a high school credit and a requirement to graduate, if you miss passing by 1-5 questions you are allowed to retake). Anyway, knowing I had the majority of my kiddos in this zone, we spent a lot of time working on “the basics” and making them even stronger. One of the activities I did with my kiddos was converting a function between it’s various forms. First, I printed off Function Match-up on 6 different colored pages. 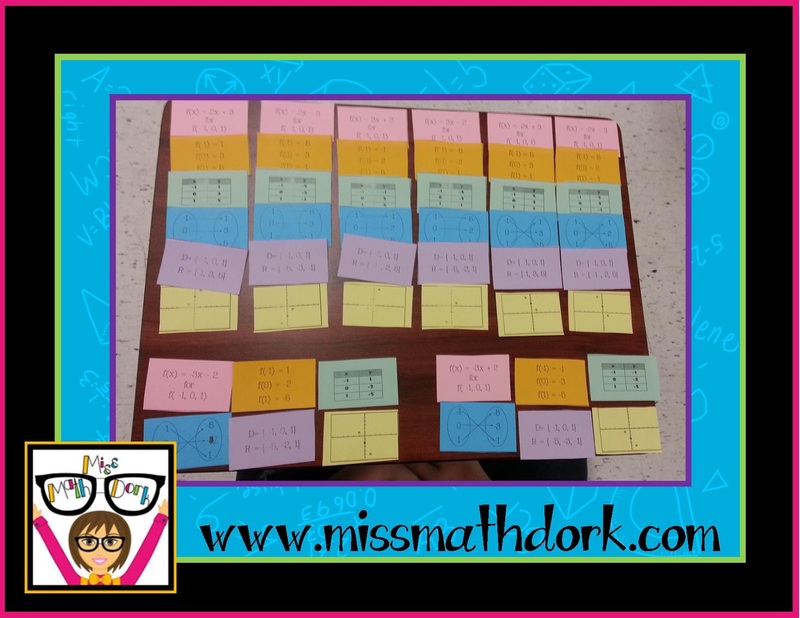 There are 6 different forms shown in this activity, you can choose to use as few or as many as you want – I chose to use all 6. Once we were cut, shuffled, and stacked, I had the kiddos start out simple with two colors. Match the pink card to the orange card! Basically, substitute in the domains on the pink cards and get the ranges on the orange. After a little reminder, this was pretty simple for them. 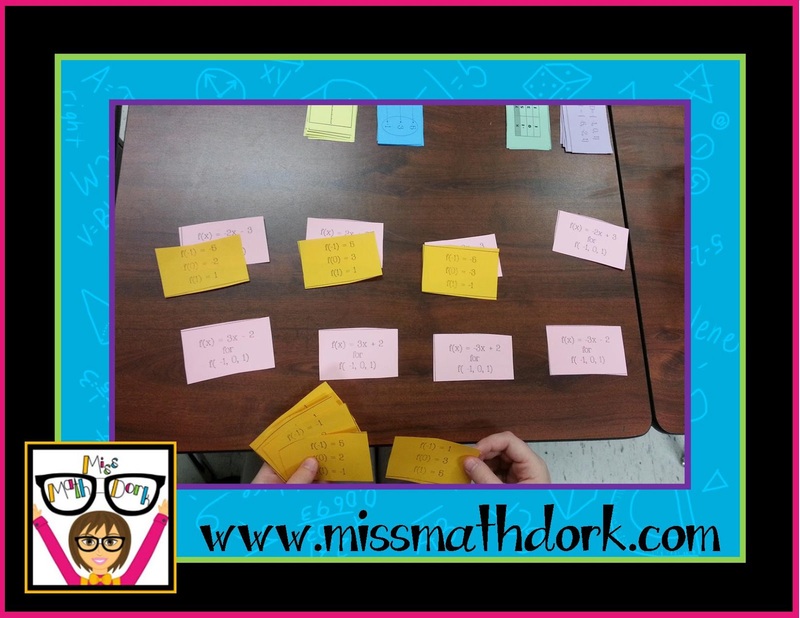 Once students had matched the pink and orange correctly, I had them add in matching the green sort cards. The kiddos said this was super easy b/c they range cards basically matched the table set up. The mapping cards were a little harder for the kiddos because they forgot to follow the arrows! Once we had a short conversation about how a mapping worked, they were golden and moved on. And finally came Domain and Range in set notation, then graphing. (purple, then yellow). The Domain and Range in set notation threw them off a bit because the numbers were listed in chronological order in the set versus the order they had been on the other cards, so they had to think a little more. Also, we had to have a conversation about how a function was an input and output that could be shown as a location on the graph. Once they were reminded of that, they easily plotted the yellow cards. Here is a final look at what 8 sets looked like once a student finished. Overall, we had some pretty awesome discussions about the fluidity of functions and how they can be represented in various ways. One aspect that I really like about this activity is all the numbers are very similar (Domain -1,0,1) (Range +-1, +-2, +-3, +-5) so they students really have to pay attention to the details. Often times when they were struggling with a match it was because they had dropped a negative unintentionally. 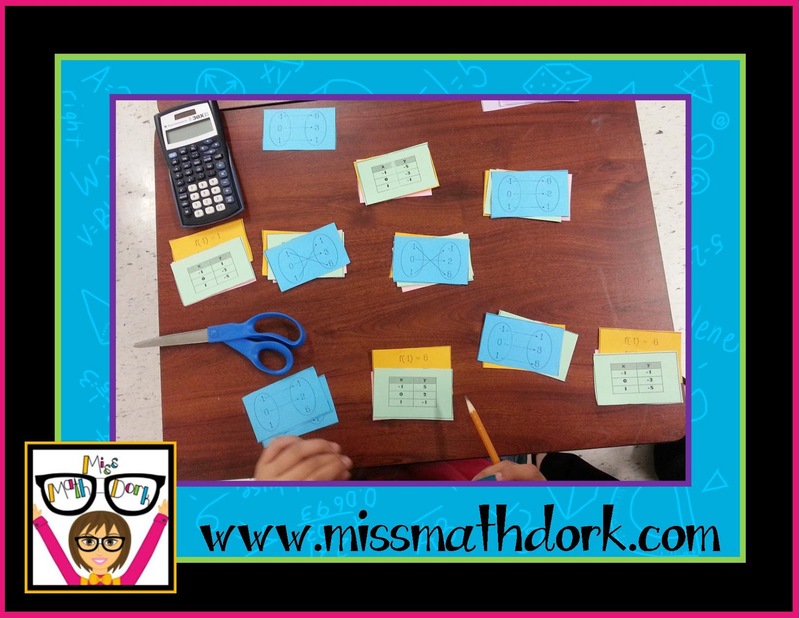 This was a really fun, and easy activity to do as a review with my kiddos. I’ve also used it when teaching functions at the beginning of the year. Then it is a bit more challenging for the kiddos, but leads to some great conversations. It can also be used very easily as a quick assessment of what your kiddos do and don’t know! So, what do you think of this activity? Is this something you could use in your classroom? Leave me some thoughts and you could win you own copy of this activity to use in your classroom! Two winners will be selected on Sunday, June 16th! Categories: mathematical engagement, mathematical reasoning, patterns, functions and algebra, and representational math. What an awesome review game Jamie! I think that this would be perfect for a lot of different Algebra skills. I might even need the review of graphing functions. Thanks so much! It ended up being a great review for these kiddos. I’ve used it as a learning tool earlier in the year before, too. 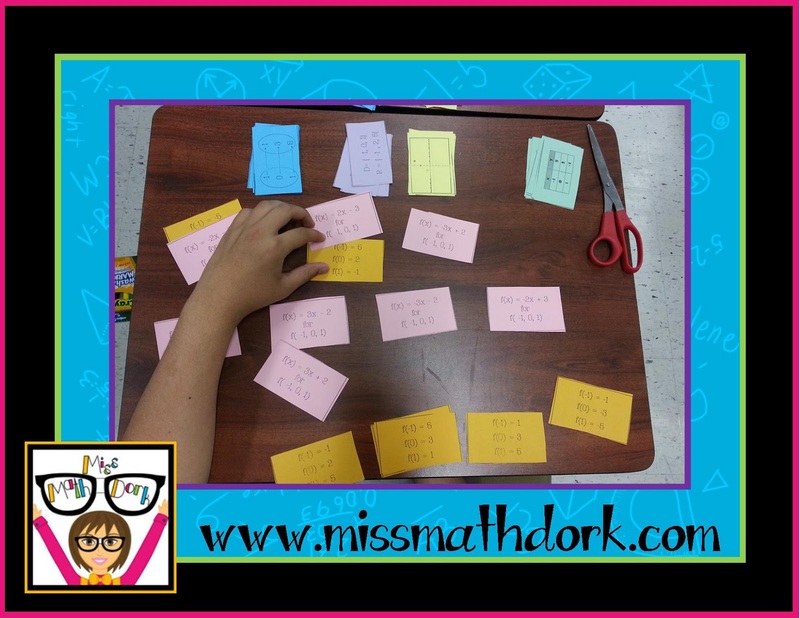 I use matching or sort cards often in my classroom. it is a great visual for them because they get to manipulate the cards and see the matches happen. I would use some of the colora in the beginning and gradually add more colors or swap some out as they learn more. Great new game for functions! For more a more challenging match you could add the graphs of the functions. Looking forward to using some great ideas next year with my Algebra classes. I’ve used matches successfully from 5th to Geometry so I don’t think you will have any issues! Thanks! We did have fun! Thanks Ginny! I like the activity because ALL kiddos are working at their own pace as I walk around and help as needed. What a great resource that shows the different representations of functions. So many resources don’t have this variety. My students would love this. No matter what age matching activities are always fun. This could be used at different phases through the year. Fun for all! Thanks Sharon! 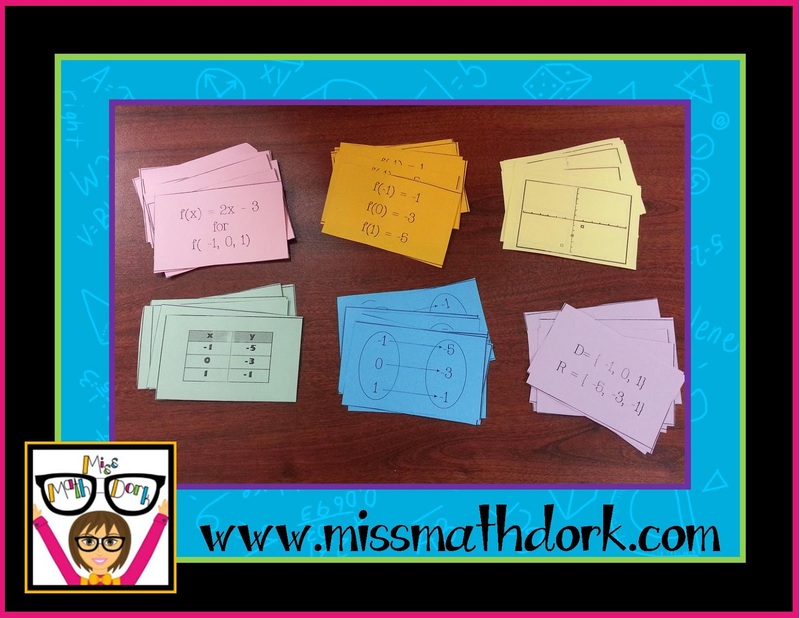 I plan to make more matches, and other differentiated tiered activities this summer! Make sure to check back! Congratulations! You have been randomly chosen as one of the two winners of this activity! Please email me at missmathdork@gmail.com to collect your prize! GENIUS!!! 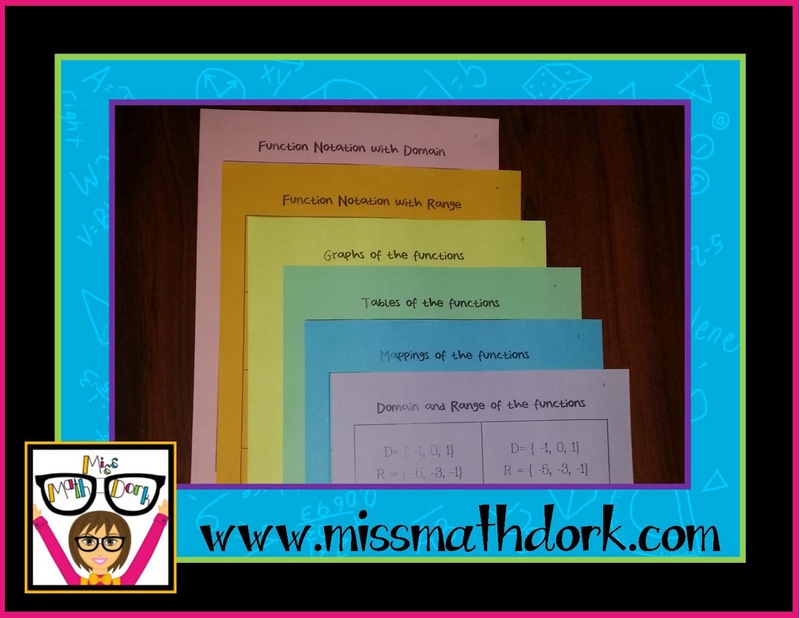 Math Rocks in your room Miss Math Dork!!!! Most definitely! I love how instantly gratifying sorts can be! What a great activity! 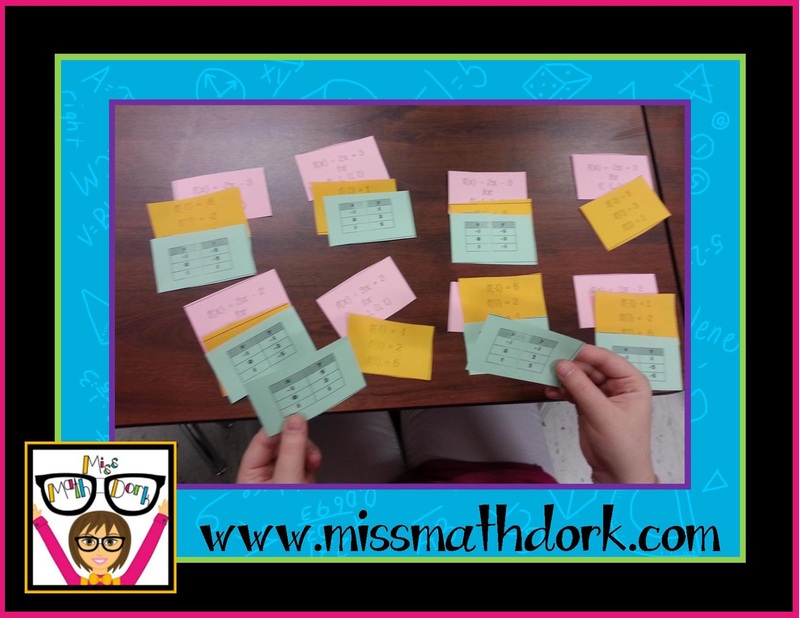 My special needs kids always struggle with functions, and I love how you can choose what ways you want your students to represent the functions – great for differentiation! The best part is using as many or as few of the representations as you want. I also chose which order I wanted them to match them. To make it harder I could have just said – go sort! Knowing my kiddos though, I knew the frustration would sky rocket! I love the versatility and simplicity of these. I’d love to add QR codes to make them self checking. Are they in an editable format? Rebecca, They are not currently editable, but if you decided to purchase them, I could flatten the images into a powerpoint so that you could add photos of the QR code on top and layer them in. My only apprehension would be that doing so would force you to choose what order the representations would be shown in. Feel free to email me at missmathdork@gmail.com and we can work something out. Just send me your TpT username for verification. I could definitely use these! I’m going to be moving up to 8th grade so I will have most of the kids I taught this year in 7th and they are going to need me to be even more creative to engage them. Plus the instant feedback is great for them!